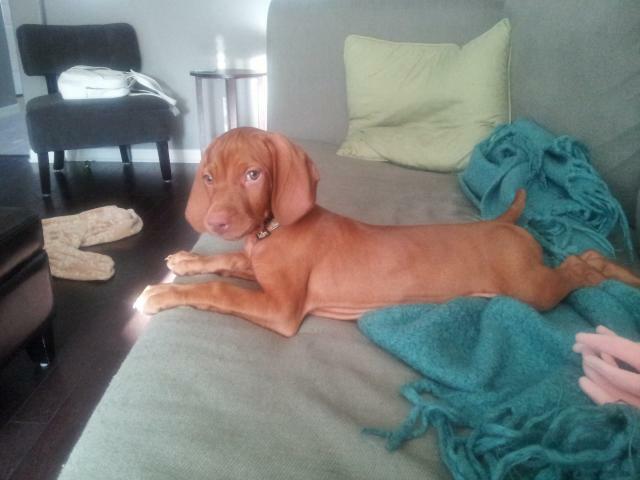 Hungarian Vizsla Forums > General Vizslas > Diet & Eating > How much to feed puppy? Ruby is 8 weeks as of tomorrow. We have had her home since Tuesday morning, and I am currently in the process of transitioning her from the food her breeder was feeding (I can't remember what it is called, but we got sent home with a Ziploc bag full) to Acana Wild Prairie variety. It's not an exclusive puppy food, but an all life stages. She appears to be losing weight in the 5 days that we've had her home. I am wondering if I am not feeding her enough, or if maybe I need to switch to a puppy food? She is getting 1/2 a cup 3x a day, total of 1.5 cups. At the breeders they fed all the puppies from her litter from one big bowl, so who knows how much she was actually eating. When I feed her, she doesn't scarf it down, it takes her about 5 minutes to eat, and sometimes I have to sit by her to get her to finish ... so I don't think she feels ravenous or anything. She's definitely lost weight though...when I pet her back I can feel her spine and hip bones slightly, and her ribs are quite visible when she lays on her side. Suggestions/opinions? ETA: here's a photo I just snapped of my little monster. Re: How much to feed puppy? I would call the breeder and ask for advice. Their food may have different fat/protein/Fiber proportions. Loosing weight is not a good thing at this stage. Quite the opposite should happen. Your little Ruby is just so CUTE!! datacan is right -- she should be gaining weight. Although she doesn't show ribs in her picture, I think if you can feel her bones that easily, you should try to find her a higher calorie food. Also, I assume the breeder had her wormed, but you could have your Vet check for intestinal parasites again, just to be sure. She should be gaining weight. Sometimes when puppies are going through growth spurts, they get "ribby" even though you know you are feeding plenty. Like datacan suggested, you could ask her breeder for advice, as well. I feed my pup on Acana Pacifica and other Acana grain free food - but mix it with raw. I am afraid I am not much help with the quantites as I found he was always hungry with the amounts suggested on the packet. I would suggest that you maybe try softening the kibble with a little bit of warm water, or gravy to temp her, and to hep her chew it. Feed her in small quantites 4 x a day and gradually increase the amounts (if she is clearing it all) until she starts to put on weight. I always feed by how they look. The guide on the packet is just that a guide! If she is eating everything you put in her bowl three times a day, I would up her food. Try going from 1 1/2 cups a day to 2 cups and see if she eats it all. No two pups take the exact amount of food during growth. Its trial and error. Just keep upping it slowly til you find whats right for her. Thanks, everyone. I am adding 1/4 cup to two feedings. Yesterday she ate all the extra at every feeeding. Today she ate all her breakfast, but just has picked at her lunch. She's very sleepy right now though. She was awake for 2.5 hours this morning and we did some training/command work with her (she now has "come" and "kennel" nailed!) so she's exhausted right now and didn't really want to wake to eat. I also realized today how much she has grown in the few days we've had her. I already had to move the partition on her crate. Crazy! I think the growth spurt might be attributing to her skinny-ness too. Our vet told us that a good rule of thumb is 1 cup daily for every 7-10 pounds. Is this consistent with what other people have heard or is this on the low side? For a puppy, especially a V pup, I think that's on the low side. Ruby is 23 pounds and is eating a total of 3.5 cups a day. She's 4 months old now.